Tomlinson WIRE CUP DISPENSER is fascinating dispensing solution for paper, foam, and plastic cups. The dispenser is lenient on space consumption whilst offering four choices of cup sizes. Amazingly simple user interface provides excellent control of dispensing. 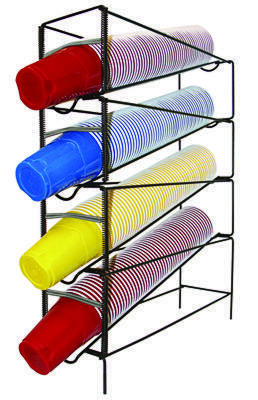 Moreover, the simple-to-use spring-loaded mechanism ascertains the seamless delivery of cups in a fastidious manner. Adjustability by twisting side springs is highly effective and it certainly assists you in enjoying the fine grain control of everyday dispensing. Tomlinson elevates the standards of the operations by providing variants like 3 Tier and 4 Tier Wire Cup Dispensers along with optional Top Lid Organizers. Enjoying seamless benefits of the perfection of the form and function is possible in real-time with Tomlinson and its wonderful products. Tomlinson Adjustable Cup Dispensers of the MODULAR DISPENSERS collection come with designing elegance to meet a broad array of dispensing requirements of hot and cold beverages as well as ice creams. Simple user interface and flexible integration of these dispensers assures to serve your customers with flair. In fact, Tomlinson provides stunningly attractive collection featuring Simpli-Size Adjustable Cup Dispenser, Pull Type Cup Dispensers, Grab-N-Go Cup Dispenser Kit, Wire Cup Dispenser, and ELC Cup Dispensers to meet virtually all requirements of dispensing. Selecting a precise fit for your application is therefore very easy. Tomlinson manufactures these dispensers using stainless steel, high-grade impact-resistant plastic and even wires. Moreover, exclusive features like self-adjusting collar, simple yet very effective and ergonomic mounting styles, excellent affordability, and a lasting performance make these dispensers a class apart and a value addition to count on. Tomlinson assists in enhancing profitability by providing numerous configurations to suit a variety of dispensing needs. Grab-N-Go Cup Dispenser Kit is a superb product for use at checkout registers and it certainly boosts the beverages sale with the instant availability. Explore the best of Tomlinson dispensers to fill gaps and serve your patrons with pride and flair. You and your patrons certainly deserve the best and Tomlinson offers only the best the industry has to offer.